While some of the nation was under a blanket of fresh fallen snow, the weather prevailed at the famed Eldora Speedway with temperatures in the low 70s and a slight breeze. The World of Outlaws race last night, the first of a two-night event, drew 39 winged warriors ready to do battle for glory at Eldora. The field included NASCAR drivers Kyle Larson and three-time Cup champion Tony Stewart, who both flew in from Talladega. David Gravel made the announcement at the historic ½-mile track that he will be driving for Bill Rose Racing full-time following Rose’s return to action in the No. 6R. Gravel makes the 14th full-time platinum driver for the Outlaws this season. Qualifying went quickly as the 39 competitors attempted to break Craig Dollansky’s 2002 track record of 12.707 seconds. In the end, the record would stand. Paul McMahan would set quick time with a lap of 13.145 seconds. 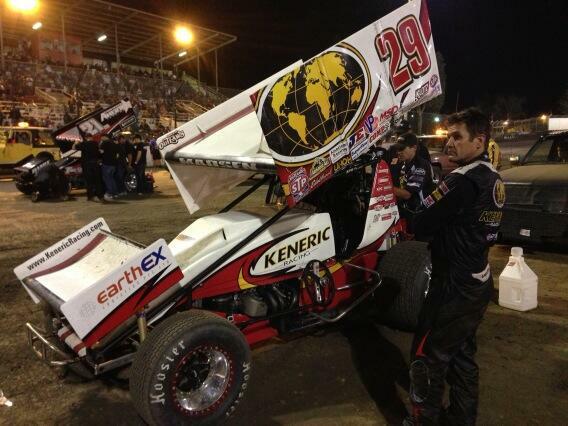 Joey Saldana, Kerry Madsen, Brian Brown and David Gravel would make up the top five. The four heat race winners were Craig Dollansky, Joey Saldana, Tim Shaffer and Sam Hafertepe Jr. Most notable of the heat races was the fact that reigning champion Donny Schatz, 20-time champion Steve Kinser and three time champion Sammy Swindell would be relegated to the B Main. After having a part break on the car in the first lap of the final heat and going straight into the wall, Swindell climbed from the car uninjured but the car was torn up severely. The Dash inversion draw was an 8, which put Sam Hafertepe Jr. on the pole for the six lap run. Brad Sweet took the lead on the opening lap of the race and never looked back. His margin of victory was 2.6 seconds. The Last Chance Showdown was a stacked race with Dale Blaney, Donny Schatz, Kraig Kinser, Steve Kinser, Brady Bacon and Jason Leffler all battling for one of four spots into the A Main. The race would be won by Dale Blaney who would be chased to the line by Sheldon Haudenschild, Terry McCarl and Donny Schatz. Sammy Swindell choose not to start the B Main, instead taking a provisional into the A Main. Steve Kinser would also take a provisional after finishing sixth in the Last Chance Showdown. The 30-lap feature had its share of drama. Brad Sweet, who won the pole and would clock a race lead stretching out to 1.6-seconds, suddenly pulled off the track and into the pits with a broken spark plug before the half-way mark. The red flag flew with 16 laps to go when Ian Madsen suffered a mechanical problem that caused him to flip between Turns 3 and 4 - he was okay. During the red flag delay, Sam Hafertepe, Jr. pulled to the trailer with an overheating engine. Sammy Swindell would again suffer a misfortune cutting down a tire and getting trapped in the pits. Joey Saldana would have a mechanical failure after hitting debris on the track during a restart. With 10 laps to go, Steve Kinser would begin smoking heavily but would nurse the ragged sounding No. 11 Bad Boy Buggies to the finish. Sheldon Haudenschild, son of Outlaws legend Jac Haudenschild, drove all the way to second before breaking an axle which would end his night. Kerry Madsen would pull a daring slide job on Craig Dollansky with 10 laps to go to take the lead. He would hold on to the lead through the single file restart for Swindell’s contact with the wall. He would hold off Craig Dollansky, Paul McMahan, Donny Schatz and Jac Haudenschild for the victory. It was Madsen's first win at the "Grand Dame of Dirt." The grand lady sighed. She had picked her prince and again it was a first time winning prince. She had flexed her muscle, gaining the respect of the toughest competitors in the sport today. Her devoted fans were happy. She would get her drink of water and a quick combing of her clay red locks before turning in for the night. Tomorrow she would again play host to these same champions. Tomorrow she would choose yet another prince. Or would it be the same prince? She has not decided as of now but by tomorrow night all will be revealed. Qualifying Results: 1) Paul McMahan 13.145 2) Joey Saldana 3) Kerry Madsen 4) Brian Brown 5) David Gravel 6) Lucas Wolfe 7) Ian Madsen 8) Jac Haudenschild 9) Craig Dollansky 10) Kyle Larson 11) Brad Sweet 12) Sam Hafertepe Jr. 13) Dale Blaney 14) Tim Kaeding 15) Tim Shaffer 16) Chad Kemenah 17) Daryn Pittman 18) Greg Wilson 19) Sheldon Haudenschild 20) Branson Maeshen 21) Cody Darrah 22) Terry McCarl 23) Jason Sides 24) Tony Stewart 25) Bryan Sebbetto 26) Donny Schatz 27) Kraig Kinser 28) Brady Bacon 29) Randy Hannagan 30) Bill Balog 31) Steve Kinser 32) Sammy Swindell 33) Phil Gressman 34) Brandon Wimmer 35) Chad Blonde 36) Cole Duncan 37) Brian Paulus 38) Jason Leffler 39) Dallas Hewitt. Heat 1 Results: 1) Craig Dollansky 2) Paul McMahan 3) David Gravel 4) Cody Darrah 5) Daryn Pittman 6) Byan Sebbetto 7) Brian Paulus 8) Dale Blaney 9) Phil Gressman 10) Randy Hannagan. Heat 4 Results: 1) Sam Hafertepe Jr. 2) Brian Brown 3) Chad Kemenah 4) Jac Haudenschild 5) Tony Stewart 6) Brady Bacon 7) Brandon Maeschen 8) Cole Duncan 9) Sammy Swindell. A Main Results: 1) Kerry Madsen 2) Craig Dollansky 3) Paul McMahan 4) Donny Schatz 5) Jac Haudenschild 6) Brian Brown 7) David Gravel 8) Lucas Wolfe 9) Tim Shaffer 10) Kyle Larson 11) Chad Kemenah 12) Dale Blaney 13) Daryn Pittman 14) Steve Kinser 15) Cody Darrah 16) Tony Stewart 18) Jason Sides 19) Sheldon Haudesnchild 20) Sammy Swindell 21) Joey Saldana 22) Sam Hafertepe Jr. 23) Ian Madsen 24) Greg Wilson 25) Brad Sweet 26) Tim Kaeding. Hard Charger of the Race: Donny Schatz who advanced 20 spots from 24th to fourth.